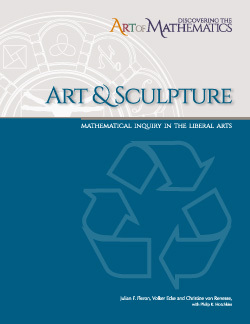 The learning guide “Discovering the Art of Mathematics: Art and Sculpture” empowers you, the explorer, to investigate the deep connections between the visual and mathematical arts. This themes pervades many of the titles in this series - perspective drawing, projections and dimensional interplay in "Geometry"; braiding in "Dance"; spirograph in "Patterns" - topics that can be easily incorporated into your investigations in this book. Here folding and cutting in origami illuminates powerful ideas from geometry. Inquiry into 3D panorama photographs reveals the beautiful mathematics powering Google Streetview. Further, you investigate the Möbius band, an important topological object which provides the classic recycling symbol as well as the structure of awareness ribbons. Flexing the paper fortune teller/cootie catcher-like flexagon reveals a magical structural pattern mimicking those same quantum states later schematically described by the Nobel-prize winning Richard Feynman. Enjoy the art and beauty of mathematics!